Stunning 2 bed top floor apartment, fully air conditioned, sleeping up to 6, with large furnished sun terrace and stunning panoramic views. 500m from the beach & a few yards from shared swimming pool. La Azohia is beautiful, tranquil and typically Spanish! The apartment is on the first floor and has a lounge/diner, kitchen with breakfast bar, 2 twin bedrooms and a bathroom. It is fully furnished and a real home away from home feel to it - you will want for nothing! 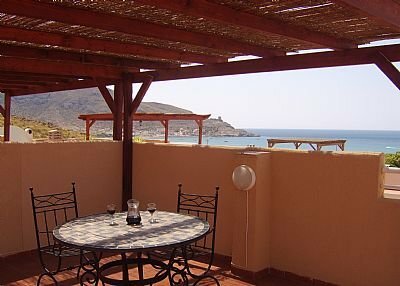 There is also a huge private roof /sun terrace with stunning views of the sea and mountains with spectacular sunsets. It has a large BBQ, wrought iron table and chairs situated beneath a pergola to give some shade to those that want it, and sun loungers for those who want to catch those rays. It is fully air-conditioned ( provides heating in the cooler months) and furnished throughout with pine furniture, TV, DVD, music system. We have also provided DVDs, CDs and books for all ages and tastes. If you have young children it is very safe and secure as we have had gates installed at the top of the stairs which can be locked. The beach is only a ten minute walk away but if you prefer the communal pool is literally next door! We have lots of pool and beach toys supplied for your use. As the apartment is fairly new there is still some work going on around the complex but this is now minimal and wont spoil your stay. There are some typically Spanish bars and restaurants in La Azohia which is just a short walk away or you can venture into Puerto de Mazarron which is taxi ride away (approx 10 - 15 mins drive). It is best to hire a car, particularly during off peak season, as you will need to it to get a round. However there are taxis and local bus services.